When it comes to flat roofing services in Cardiff, you need a specialist with experience in this type of work. Whether it’s installation, maintenance or repair, you have to hire roofers who are well-versed in flat roofs. K.C Smith is one company that you can trust for a range of flat roofing services. For years, we have handled flat roofs for residential and commercial properties. Regardless of the project, you can rely on the workmanship of our highly trained roofers. We use the latest tools and techniques to ensure that our customers in Cardiff enjoy long-lasting roofs. A flat roof is at risk of the same damage as other types of roofs. Leaks are particularly common challenges for property owners. Old age, inadequate or improper maintenance and poor installation are some of the reasons your flat roof may suffer damage. The right repairs carried out in good time can save you a considerable amount of money. Flat roof repairs are some of the services that we provide for our domestic and commercial clients in Cardiff. Our roofers will inspect your installation, find the root of the problem and fix it. If your roof is suffering from material shrinkage or leakage, request our repair services in Cardiff. Flat roofs can offer tremendous service if they are set up well and get the care they need. By hiring a Cardiff based flat roof specialist like ourselves, you can guarantee professional installation, maintenance and repair. K.C Smith works with top suppliers in the region to ensure that we use high-grade material on flat roofs. Our roofers are trained and are up to date on building codes, so believe that we will deliver safe and functional roofs. 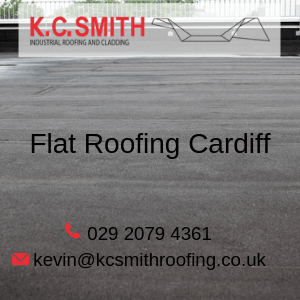 K.C Smith is a trusted provider of flat roofing in Cardiff from repairs to replacements. Contact us for reliable, affordable and high-quality services in Cardiff.